Carrier’s Infinity Fan Coils are the easiest way to boost cooling savings by up to 16%, and heating savings up to 10%. They offer support for Puron® Refrigerant, and feature ArmorCoat™ tin plating. Carrier’s Performance Fan Coils are a simple way to boost cooling savings by up to 16% and heating savings up to 10%. They support Puron® Refrigerant and with ArmorCoat™ tin-plating, these fan coils reliably improve the efficiency of a comfort system. 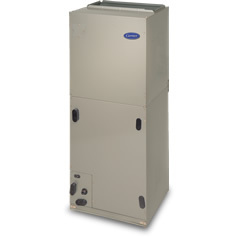 Carrier’s Comfort Fan Coils boost the efficiency and performance of your home heating and air conditioning. Built with solid Carrier technology, such as support for Puron® Refrigerant, it improves your home’s environment and air quality.